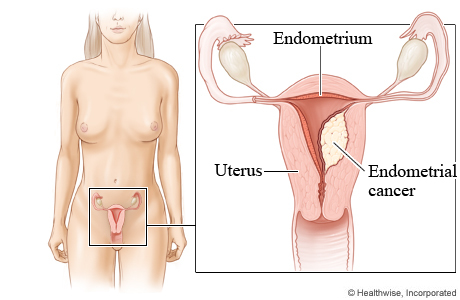 Endometrial cancer is a gynecological malignancy that involves the endometrium of the uterus. It is believed that estrogen signaling in the uterus (especially unopposed by progesterone) is a cause of endometrial cancer. This malignancy can progress form endometrial hyperplasia, but can also be sporadic. Adenocarcinoma is the most common type of endometrial cancer. Endometrial cancer can be an aggressive disease that progresses rapidly. Risk factors: Lynch syndrome (HNPCC), tamoxifen usage, polycystic ovarian syndrome, estrogen usage, early menarche/late menopause, nulliparity, infertility with anovulatory cycles, and obesity. Endometrial biopsy is eventually needed to confirm suspicions of endometrial cancer. 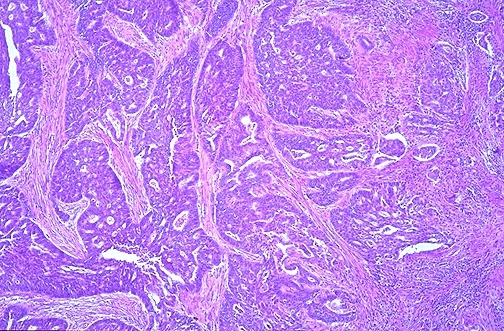 Cancers derived form hyperplasia are endometrioid in appearance (endometrium-like) while sporadic cancers are often serous and is characterized by papillary structures with psammoma body formation. This is a potentially life threatening condition. Patients have a better prognosis the earlier this disease is diagnosed. Oral contraceptives can be protective against endometrial cancer. Metastasis/spread of the disease is a concern.